New year, new you, right? Gyms are always more crowded in January than any other time, until attendance dwindles to a lull about mid-March. Why is that? Boredom, fatigue or lack of motivation are a few reasons not to drag yourself off the couch and into the gym during the winter. 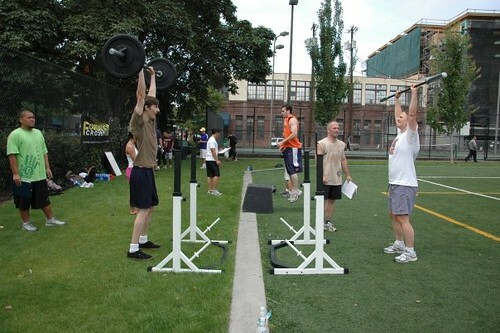 New Capitol Hill gym Foundation CrossFit promises to change that. They offer outside-the-box workout strategies and fun tools to get you motivated in their new gym, located at 1422 11th Ave., down the driveway underneath the rear entrance of Pacific Supply Co. The gym’s grand opening is this Sunday, January 31st beginning at 11 a.m. You’ll get to meet the staff, watch a fitness demonstration and even work out with them if you want to. There will be a special grand opening membership pricing offer to those in attendance. Door prizes and merchandise will be given away and Foundation CrossFit will host a potluck with some local vendors and Seattle DJ Marc Sense will entertain the crowd. Foundation CrossFit features a 2400 square foot workout space in a warehouse setting – a big change from the 300 square foot garage the company started in. Open space to move and work is essential to the CrossFit philosophy. They have done group workouts at Cal Anderson in good weather and encourage movement. “We want you to use your body as you would in real life,” said gym owner Tony Lau. Here, treadmills and ellipticals are taboo – kettlebells, sledgehammers, wooden dowels, PVC pipes and even pogo sticks are part of their arsenal. The gym will feature hour-long classes that will begin with a group warm-up then skill lesson, followed by 20 minutes of intense exercise and cool down. Individual progress will be tracked so the member can see what they’ve achieved after a number of workouts. If you’re the type of person who walks in to a gym head down with headphones on and walks straight to the nearest elliptical, this gym may not be the place for you. The trainers keep score after the workouts to see who is performing at what level, pushing each to their limit and encouraging friendly competition along the way. “It’s like PE class for adults,” said Andrew. 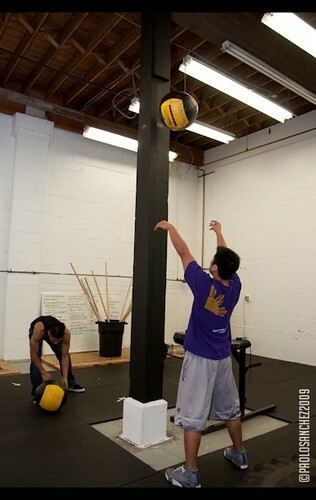 Foundation CrossFit offers a free one-hour individual consultation with Andrew. In that hour he discusses individual fitness goals and special needs, gives a tour of the facility and offers an optional workout to get the ball rolling. “Our training system emphasizes mechanics, consistency, and intensity,” said Andrew. The drop-in class rate is $20 per class. They will also offer monthly CrossFit rates that reflect a significant discount, depending on how often a client attends the classes – ranging from $135 ($15 per class) for two classes per week to $185 ($8 per class) for unlimited classes per month. UPDATE – The Grand Opening Promotion will run through the month of February. Unlimited CrossFit at $135/month (originally $185). This promotion is valid throughout the entire month of February, and you may prepay for as many months of Unlimited CrossFit at this rate before the promotion ends. Find Foundation CrossFit on Facebook, follow them on Twitter or check out their website or Yelp! page. I love CrossFit. It’s a pity it’s so expensive. They can never compete with 24 Hour Fitness. Awesome article. I’ve stopped by their gym. Thanks for posting! How much is too much to pay for you health? I went to 24hr for a long time before joining Foundation Crossfit and never saw the results I have seen in just a few short months. I’ve been working out harder than ever and have a renewed dedication to proper eating habits thanks to FCF. I’m willing to pay $100 a month more than I did at 24hr for that. What are ur class times for beginners?